(I realise that this site is devoted to England, but we couldn’t resist covering Wales at least once). Any trip to the United Kingdom is incomplete without a day, or a few days, spent discovering the charms of Wales. World famous for its castles, its coastline and its Celtic culture, this vibrant country has lots on offer for travellers of all tastes. There are lots of great places to go, but we’ve chosen the best in East, West, North and South Wales. Situated in the north of Wales, visitors to Snowdonia should ideally allow at least a week to take in all this stunning national park has to offer. Snowdonia is perhaps best known for Mount Snowden, the highest mountain in England and Wales, which offers views from Pembrokeshire to Ireland. Challenging terrain makes it perfect for the experienced walker, or those looking to push themselves. A Sherpa shuttle bus runs around the base of the mountain, easily linking all six of the various climbing routes. The Welsh Highland Railway is the longest heritage railway in Britain. Running from Caernarfon to Porthmadog, with many stops in between, this is the perfect way to experience the beauty of Snowdonia with the power of steam. If unique activities are on your holiday to-do list, Snowdonia has lots to offer. Most notably, Snowdonia has recently come to be known as the zip-line capital of the world, thanks to the opening of Zip World Velocity, where you can fly along the Europe’s longest zip line at speeds of up to 100mph. Rather take things at a slower pace? Take a visit to Bounce Below, a vast slate cavern strung with nets and giant trampolines, the first in the world of its kind. Next up are three of Wales’ finest buildings: three of the so called ‘iron ring’ castles built by King Edward I of England in the 13th century to subdue the Welsh. The current Caernarfon Castle, our first choice, was started in 1283; there had been earlier forts there since earlier medieval times. It is also where Prince Charles, the current Prince of Wales, was crowned (by his mother HM The Queen) in 1969. Also in North Wales Conwy is Caernarfon’s smaller sister. Further south than the other two, Harlech Castle is on a spur of land jutting out into the North Sea. It’s most famous now for the stiring hymn ‘Men Of Harlech’ about a 7 year siege of the castle in the 15th century. 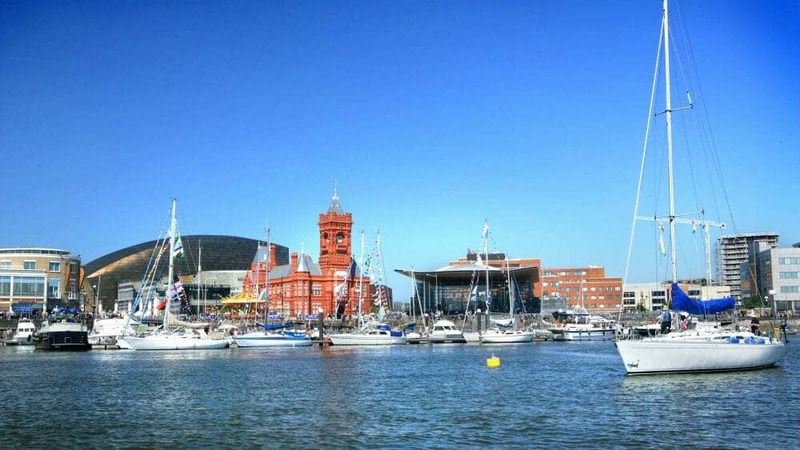 If you wish to visit Wales but only have an afternoon do so, its capital city, Cardiff, is a great choice of destination. This thriving centre of culture, entertainment and sport is only a short train journey from London or Bristol. For your fix of Welsh art and history head to the National Museum Cardiff, which houses Wales’s national art, geology, and natural history collections. Highlights from the permanent display include works by prominent Impressionists such as Claude Monet and Vincent van Gogh. The Wales Millennium Centre in Cardiff is an iconic arts and culture destination. From West End musicals to art exhibitions, the centre has a plethora of entertainment options available for a fun night out in the Welsh capital. Any visit to Cardiff should include a trip to Cardiff Castle. This 2000-year-old monument has plenty of character and boasts stunning views of the city and beyond from the top of the keep. Fans of British sci-fi show Doctor Who should head to the Doctor Who Experience on Cardiff Bay, which is home to a range of interactive exhibits and the largest collection of Doctor Who costumes, props and sets from the TV show past and present. Location tours are also offered, both on foot and by bus, and include visits to famous filming locations from the series around the city of Cardiff. The Wye Valley is an ideal destination for visitors with only a day or two to visit Wales. An area of outstanding natural beauty on the border between England and Wales, it has lots to offer, from historic buildings and famous castles to nature walks and literary fixes. For unforgettable scenery head to Tintern Abbey, the best-preserved medieval abbey in Wales. This sublimely beautiful ruin was visited by Romantic artists such as Wordsworth and Turner. Another great spot is Chepstow Castle, a Norman castle perched high above the river Wye. If that doesn’t whet your appetite for history, head to Caldicot Castle and Country Park, which regularly hosts activities such as archery lessons, falconry shows, medieval banquets and reenactments, truly bringing the history of the site to life. The small market town of Hay-on-Wye provides the ideal day-trip destination for literary lovers. Home to the eponymous annual literary festival, Hay is world famous for its range of secondhand and antiquarian bookshops. A traditional market is held every Thursday, selling local produce, antiques and homemade gifts. Hay is also an ideal location for a more active getaway, with canoeing, wild camping and mountain biking activities aplenty. Pembrokeshire is home to a national park and boasts some of the best beaches in Europe. Whether you like surfing, walking, beach-combing or wildlife watching, this is the place for you. A great destination for a family holiday, allow at least a long weekend to enjoy all that this beautiful place has to offer. The Pembrokeshire coastal path runs for 186 miles (299km) through some of the most stunning scenery in Britain. To walk the whole thing would take about 2 weeks, but most visitors choose to take it a piece at a time. The picturesque city of St David’s makes a great base for exploring the surrounding coast. On St David’s peninsula, you will find Whitesands Beach: a wide expanse of vast white sand and one of the best beaches for surfing in the country. To the south of St David’s visit Solva Harbour, a great location to launch your kayak or embark on a coastal path walk. To the north of St David’s is Porthgain, a small coastal hamlet and home to the Sloop Inn, one of the most popular pubs in Pembrokeshire, and a great place to tuck into some fresh fish and a cold drink after a long day. You’ll also find a number of independent art galleries to explore, showcasing the work of Pembrokeshire’s local artists and craftspeople. If you haven’t already seen enough flora and fauna on your trip to Pembrokeshire, you can pay a visit to the Welsh Wildlife Centre in Cardigan. A great place for adults and children alike, the centre offers an adventure play area, bird-watching hides and a Glasshouse cafe serving local food and stunning views over the wildlife reserve. Wherever you decide to visit in Wales, you’ll find it hard not to want to return for more. From the stunning coastline to the mountainous terrain and architectural wonders, this country is full of charms that could easily take years to explore.